If ever there were a domain of science that draws on and fuels imaginaries of a total archive, genomics is it. Genomics promises to reveal the secrets of life, to cure cancer, to solve the world’s energy problems, but only if we create open access to all genomic data. Life demands nothing less. In the dominant popular account of genomics, scientists who pioneered genomic techniques while working on the Human Genome Project (HGP) fought an epic battle to create such an archive of genomic data that all could contribute to and access (Shreeve 2005; Sulston and Ferry 2002). In this story, a moral economy of science guided by the norms of openness and communalism struggled to survive in the face of the growing power and widening influence of a capitalist economy. Judgment is clear: leaders of the public effort to sequence the human genome were heroes; Craig Venter and his venture capitalist backers were villains. In these accounts of the HGP, the quest to share human genome information—to create an open genomic archive—motivated scientists working on the public Human Genome Project, and led to their passionate commitment and personal sacrifices. At my own institution, the University of California, Santa Cruz, Jim Kent reportedly spent day and night in his garage writing code, stopping only to ice his wrists (Townsend 2015). Yet, questions arose on the ground about the value and meaning of an endeavor that required an ever-growing number of automated sequencers to displace humans and to consume large amounts of reagents and capital (Sulston and Ferry 2002:177). Who and what benefitted from these informatic and automatic infrastructures designed to create, store, and manage ever-expanding archives of genomic data? Despite the valiant effort to defend public science, many on the ground feared that genomics installed a technocratic and capitalist regime at the heart of the life sciences in which power inhered in the few who had the money to buy and operate sequencing machines. Their concerns did not go unstoried. 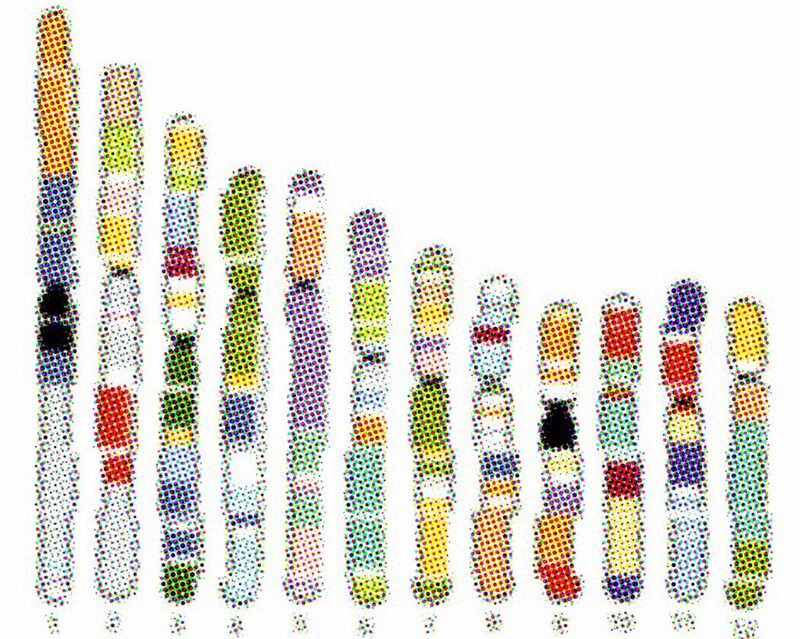 Many genome scientists wrote accounts of the HGP that brought to the fore these deeper structural transformations that unsettled understandings of the value of shared data—total or otherwise—as the grounds of knowledge and the public good. Illustrative is John Sultson’s The Common Thread (Sulston and Ferry 2002). Sulston led the UK arm of the HGP, and is widely recognized as a hero of the effort to defend public access to human genome sequence. Yet the book’s opening line makes clear that his would be no simple tale of triumph: “I just heard the prison door close behind us” (Sulston and Ferry 2002:1). This startling description recounts the moment Sulston realizes that he has signed onto the HGP, and there is no going back. In the pages that follow, he chronicles the transformation of his everyday work life as it moves from the small intimate spaces of intense human interaction at the Laboratory of Molecular Biology (LMB) in Cambridge to the vast cavernous spaces of the sequencing machines at the Sanger Center, built in Hinxton. We learn of a life no longer marked by late-night encounters in the lab, coffee time, drunken punting expeditions, and Guy Fawkes celebrations, but one lived under the pressure of keeping an army of sequencing machines running on schedule (Sulston and Ferry 2002:50). Sulston reluctantly, but seemingly inexorably, enters a capitalist world of production. The amounts of money required continually threaten to overreach the capacities of public governments and private foundations, making the HGP vulnerable to a venture capital takeover (Sulston and Ferry 2002:99). Sulston receives multiple offers to join private industry, offers he reportedly always took seriously. And while he accuses Venter of no longer being in science, but in business, just a few pages on in his account he explains that he too was in business: “Bob [Waterston] and I had the biggest businesses at the time; Eric Lander aspired to have the biggest business” (Sulston and Ferry 2002:189). These businesses sought to operate at ever-greater speeds and efficiency. For this, they required ever-greater resources and tightly controlled management. Not everyone could take part. Indeed, many would be excluded. At the end of the HGP, of the 20 listed as authors on the Nature paper, only two, Sulston argues, had “the high level of industrial organization needed to accelerate the production of sequence”: the Sanger Center and Bob Waterston’s lab at the University of Washington in St. Louis (Sulston and Ferry 2002:203). Despite his allegiance to the ethos and practices of openness he attributed to the LMB, Sulston found himself a central character in this transformation of his field of biology into an industrial-scale production system that excluded all who could not keep up. It was, along with other domains of knowledge, becoming a part of informatic capitalism. Knowledge, Francois Lyotard argued a decade before the launch of the HGP, had become “an informational commodity indispensable to productive power.” Indeed, he asserted, it was “a major—perhaps the major—stake in the worldwide competition for power” (Lyotard 1979:5. Certainly, by the mid 1990s, actors central to genomics acted as if this were the case. Craig Venter and his financier Wally Steinberg justified their entrée into the race to sequence the human genome as nothing less than an effort to “save America’s biotech industry.” By 2000, the fortunes of the U.S. stock market hinged on events in human genomics, and world leaders took an active role in its governance (Sulston and Ferry 2002:247). While predicted by a social theorist a decade prior, Sulston, a biologist, lived through and described these changes. “Biology,” he observes, “had undergone an economic sea change—it now held the promise not only of tremendous knowledge and great benefits to humankind but also fabulous wealth. As biologists we had lost our innocence” (Sulston and Ferry 2002:209). The changes left untouched all dimensions of the scientific life Sulston had known: its buildings, its practices, and even the core value of openness itself. By the end of the HGP, it was the very goal of an open and total archive of genomic data that fueled the goals of production and wealth accumulation that befit the sequencing machines. After Venter announced at the Cold Spring Harbor meetings that ABI was going to fund a company to sequence the human genome, both Wellcome and the National Institutes of Health (NIH) greatly increased the amount of funds they devoted to the HGP, entering the sequencing machines “arms race” (Sulston and Ferry 2002:220). 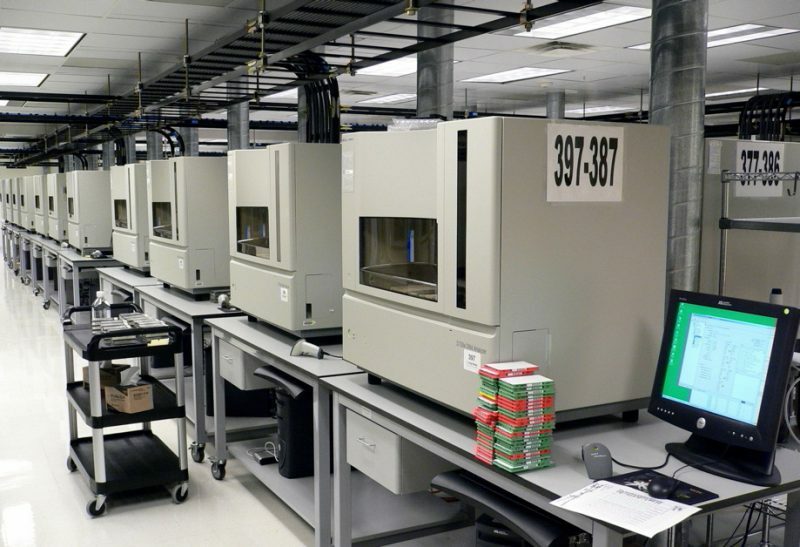 In the fall of 1998, The Sanger Center bought 30 of the new ABI capillary sequencing machines at $300,000 apiece; Eric Lander at the Broad Institute bought 125. In 1999, the year after Venter launched Celera, ABI sold a billion dollars’ worth of sequencing machines. If there was any clear winner in the race to complete the human genome sequence, it was this manufacturer of the machines (affectionately known by some genome scientists as “Arrogant Beyond Imagination”; Shreeve 2005:60). Sulston and others at the Sanger Center did try and resist this big-money dimension of genomics. Reportedly, Tim Hubbard, then head of sequence analysis at Sanger, explored the possibility of using a “copyleft” agreement developed by the free software movement to protect the public project’s human genome data (Love and Hubbard 2005). Such an agreement would have provided a formal legal meaning to the HGP’s principle of open access, specifying that all were free to use HGP genome data but could place no restrictions (e.g., patents) on its further development. However, those who oversaw the public genome databases reportedly strongly objected. The data, they argued, should remain free for all to use in whatever way they saw fit, including patenting and licensing further development and redistribution of the data (Sulston and Ferry 2002:238; see also Cukier 2003). There was indeed no going back, not even for openness. The power to sequence—and thus to play a major role in the genomics revolution—was already concentrated in a few institutions. Wealth had become a major stake in biology. Inequalities between researchers—both among the genome mappers and sequencers and subfields of biology—became institutionalized as the price paid for universal access to the sequence of the human genome. Today, the injunction to share and to make available all genomic information— not just of the human genome, but all genomes—is driven once again by a belief in the tremendous power of genomics. Consider this billboard I encountered as I was riding my bike home from a movie in January of 2015. Genomics defeats cancer. San Francisco billboard. 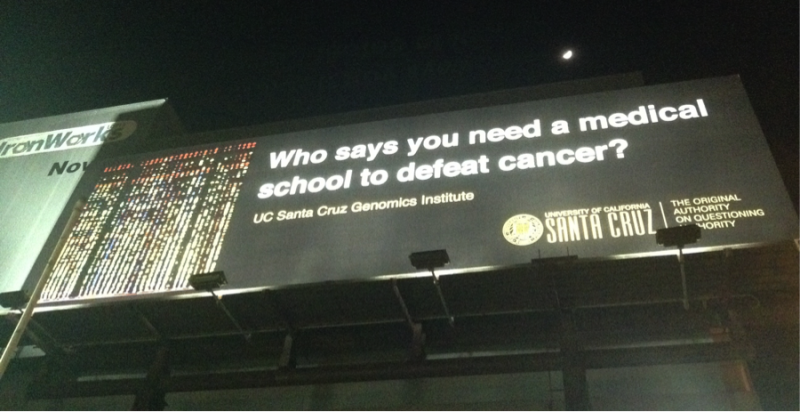 The billboard stands at a busy intersection in San Francisco where tens of thousands pass by every day. These messages about the power of genomics are joined by messages about the importance of sharing one’s DNA and data. Perhaps later, while on Facebook, Bay Area citizens will come across MeForYou.org and learn how they can help another UC, the University of California, San Francisco (UCSF), through sharing their DNA and medical records (http://meforyou.org). UCSF launched the MeForYou.org social media campaign to “put a new thought into the public consciousness” that sharing genomic data and medical records not only helps science, but also communities and loved ones. MeForYou, UCSF spokesperson David Arrington argues, is part of an effort to create a new “social contract” with biomedicine in which people agree to share their data in exchange for new knowledge that helps all people (Lu 2013). The moral force of the initiative is strong. Who, after all, would not want to help Georgia, the young girl who is the MeForYou poster child? Dissent—or even public dialogue—under these conditions is difficult. These dreams of total access to all genomic information inspire and create visions of new routes to universal knowledge and democracy. Yet these commitments to the open flow of genomic information exclude and exert control in ways that led even genomics’ most ardent supporter to invoke the imagery of a prison. We are in need of languages and frameworks that allow us to grasp and speak about these powerful and paradoxical dimensions of our ever-deepening commitments to total archives in an age of bioinformatics. The story of how genomics arose out of and fuels contemporary aspirations for a total archive is complex one for which I can give only a very partial account. There are many parts of the story that I cannot even begin to address: for example, how it came to be that anyone thought genomics might contain the complete information—the code—of life. For this, see Lily Kay’s excellent historical account (2000). And increasingly many other kinds of data too: environmental, health record, drug surveillance, social media, and other “omics” data, just to provide a short list. For a list of grand things that genomics promises to bring us, pick up any popular account of genomics. For example, see Collins (2006) and Venter (2007). The term “moral economy” was coined by E. P. Thompson in the1960s to described the norms and practices that regulated exchange during the eighteenth-century bread riots. It was imported to the history of science by Robert Kohler to describe Drosophila geneticists’ practices of exchange (see Kohler 1994; Thompson 1963). While Venter receives most of the critical attention, Randy Scott, the Chief Science Officer at Incyte Genomics Inc., attempted to patent ESTs as early as 1991. Further, Scott never sought to make genomic data public, while Venter did (Venter 2007). At the time, I heard one geneticist describe the situation as nothing short of a Maoist struggle of the people waged this time not with guns, but with sequencing machines. On the centrality of speed to the HGP, see Fortun (1998). For a definition of informatic capitalism as I use it, see Franklin (2012). Key components are the rise of information as a dominant commodity form, the simultaneous and entwined production of markets and informatics and their re-working of both labor and knowledge. Steinberg argued that NIH did not have the resources to compete with Japan, Britain, and Germany (Venter 2007:158). In March of 2000, UK Prime Minister Tony Blair and U.S. President Bill Clinton made a public statement affirming the Bermuda principle that genomic data would be made freely available. Immediately, the Nasdaq—the index of high-technology stocks—lost 200 points. Biotechnology stocks lost $30 billion in value in one day alone. The value returned when the President’s science advisor and Francis Collins clarified that the principle of openness did not prevent use of the data by private companies. Note that Sulston is referring here to only a small band of biologists: those involved in genome sequencing. The extent to which they represented the leading edge of broader transformations that led to all biologists “losing their innocence” is still a matter of debate among historians, sociologists, and anthropologists of science (Sulston and Ferry 2002:209). How scientists were able to persuade governments to support public genomics in the late 1990s—a time marked by privatization of formerly public sectors—deserves further explanation. One key to this puzzle is the way in which publicness easily figured as a form of openness that fostered efficiency in informatic work. In other words, as Sulston would later make clear, openness was not just a political goal; it was a practical and technical one. For a further exploration of the alignment of “public” genomics with an informatic/technocratic conception of openness, see Reardon (forthcoming). Shorett, Rabinow and Billings captured these changes at the time in their 2003 commentary in Nature Biotechnology (2003). Sulston is explicit throughout his account that genomics created inequalities among researchers. In the end, those with the most efficient sequencing operations captured most of the funding. The norm of openness itself favored those with more resources who would not be hurt by making data public before articles were published, and who had the labor and money to upload data to GenBank (see Reardon forthcoming). Collins, Francis. 2006. The Language of God: A Scientists Presents Evidence for Belief New York, NY: Free Press. Cukier, Kenneth Neil. 2003. “Open Source Biotech: Can a Non-Proprietary Approach to Intellectual Property Work in the Life Sciences?” The Acumen Journal of Life Sciences 1(3). Available at link. Fortun, Michael A. 1998. “The Human Genome Project and the Acceleration of Biotechnology.” In Private Science: Biotechnology and the Rise of the Molecular Sciences, edited by A. Thackray, pp. 182–201. Philadelphia: University of Pennsylvania Press. Franklin, Seb. 2012. “Virality, Informatics, and Critique; or, Can There Be Such a Thing as Radical Computation?” Women’s Studies Quarterly 40(1/2):153–170. Kay, Lily. 2000. Who Wrote the Book of Life? A History of the Genetic Code. Palo Alto, CA: Stanford University Press. Kohler, Robert. 1994. Lords of the Fly: Drosophila Genetics and the Experimental Life. Chicago and London: University of Chicago Press. Love, James, and Tim Hubbard. 2005. “Paying for Public Goods.” In Collaborative Ownership and the Digital Economy, edited by R. A. Ghosh, pp. 207-229 Cambridge, MA and London, England: MIT Press. Lyotard, Jean-Francois. 1979. The Postmodern Condition: A Report on Knowledge. Minneapolis: University of Minnesota Press. Reardon, Jenny. Forthcoming The Postgenomic Condition: Ethics, Justice, Knowledge After the Genome. Chicago, IL: University of Chicago Press. Shorett, Peter, Paul Rabinow, and Paul R. Billings. 2003. “The Changing Norms of the Life Sciences.” Nature Biotechnology 21(2):123–125. Shreeve, James. 2005. The Genome War: How Craig Venter Tried to Capture the Code of Life and Save the World. New York: Ballantine Books. Sulston, John, and Georgina Ferry. 2002. The Common Thread: A Story of Science, Politics, Ethics, and the Human Genome. Washington, DC: John Henry Press. Lu, Stacy. 2013. “Want to Help Heal the World? Start by Sharing your Health Data.” TedMed, May 13. Available at link. Thompson, E. P. 1963. The Making of the the English Working Class. London: Victor Gollancz. Townsend, Peggy. 2015. “A Visionary, a Genius, and the Human Genome.” UC Santa Cruz Genomics Institute, June 22. Available at link. Venter, J. Craig. 2007. A Life Decoded: My Genome, My Life. New York, NY: Viking.